The governor says an unconstitutional veto of a provision in the state budget was just a mistake. 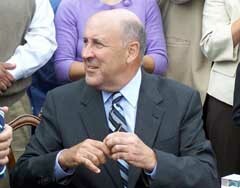 Governor Jim Doyle is coming under fire, after he used the so-called "Frankenstein veto" on a provision in the state budget. The power of the governor to delete parts of sentences to create new language, which changes the intent of a bill, was taken away after a recent constitutional amendment. The budget veto in questions would have changed how, who, and when a study on state facilities for the mentally retarded would be carried out. Doyle says the accidental use of his former veto power was just a mistake and was overlooked by his staff and the Legislative Reference Bureau in the short time frame they had to go over the budget. Doyle signed the budget bill and made 81 vetoes just over two days after it passed the Legislature. Legislative leaders are reviewing their options and believe the law should stand as it was originally passed. Doyle says he&apos;s fine with just doing the study as originally written. Speaking with reporters, Doyle downplayed the impact of his actions. He says it was a "technical little thing" in the budget and it&apos;s not a big deal if his veto doesn&apos;t stand.